Lee Herold, DVM, DACVECC, discusses blood types, blood components, and monitoring for transfusion reactions. You mentioned diphenhydramine and steroids to treat transfusion related fever but those reactions are not histamine mediated. I don't believe Benadryl has any effect on them and in most cases they are self-limiting anyway. Thanks Roger for your comments. You are absolutely correct that if the fever is the result of febrile non-hemolytic transfusion reaction then these reactions are not histamine mediated. However the recommendation to treat is because unfortunately clinically we have very insensitive indicators of allergic or anaphylactic reaction, so we use fever (along with development of urticaria, respiratory signs, GI signs) as markers of possible reactions which we can intervene to reduce the clinical consequences of. Do You recommend keeping oxyglobin instead of pRBC for low volume slower environment hospital?? Great question Ramon. Oxyglobin has a 3 year shelf life from the time of manufacture whereas pRBCs expire in 4-6 weeks depending on the nutrient and storage solution that is used. So if you are only giving a transfusion once to twice a year...you will save money in expired product by keeping oxyglobin around. However the challenge is that oxyglobin is no longer available in the U.S. Biopure (the original manufacturer) discontinued its production and recently sold the product to OPK Biotech a company that has made the solution available in the UK only. But maybe the market will change and oxyglobin will come our way again. 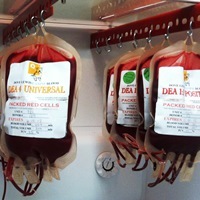 Depending on where you are located you may be able to purchase pRBC from a local referral clinic that does blood banking instead of keeping product in stock. Alternatively there are national commercial blood banks that can overnight an order or pRBCs- some of them are listed a slide in the talk. I know that doesn't work for all emergent patients that need immediate oxygen carrying capacity but may work for some subset of patients. I'm confused with the safe donation amounts as the calcula tipi on are much lower than what is typically drawn. For instance, a 20kg dog could donate 200mls per that calculation, but a 25kg dog typically had 400-450mls pulled for donation. Dogs can safely donate about 10-20% of their blood volume. The examples given in the slide were conservative calculations. They were given as examples with two points in mind 1.I was speaking in the context of drawing blood from an in house or spontaneous donor (usually a dog owned by an employee) that you needed to draw from because you didn't have access to stored blood. I wanted to underscore the point that any animal (even a small dog) can donate blood-you simply need to keep in mind some volume limits of how much can be donated safely. 2. The second point in mind when I gave these examples was that they are easy to remember as trends (ie. 10kg dog donates 100mls, 20kg-200mls, 30kg-300mls etc). If you collect blood for donation infrequently and forget or are not able to find the blood volume equation to do the 10-20% blood volume calculation then the example gives a trend that is safe for the donor and easy to remember. In the examples the 200ml in the 20kg dog would be about 11% of his blood volume and he could donate up to 360ml which would be 20% of his blood volume. You are correct the 25kg dog (the typical lower cut-off weight for most blood donor programs) can donate 225-450ml (10-20% of blood volume). In a study of healthy greyhound blood donors that had variable weights- they took the "standard" blood volume = 450ml/donation and measured blood pressure before and after donation. The 450ml donation volume equated to anywhere from 12-21% of the blood volume of the donor greyhound depending on their body weight. This study did demonstrate a significant decrease in systolic blood pressure after donation in all donors compared to baseline however only one dog had systolic pressure <100mmHg and no dogs had clinical evidence of hypotension. Though blood donors can donate safely we have to acknowledge that blood donation does lower blood pressure and does have some potential negative effects on the donor- so our goals would be to try minimize that effect. Excellent video! Very thorough and well explained, and very interesting. Thank you! There is a debate in our hospital about warming up pRBCs. Some technicians have been trained to warm them to room temperature in a warm water bath no warmer than 98 degree F. Others have been taught that this will promote the growth of bacteria and can damage the rbc's. Can you give us some insight? 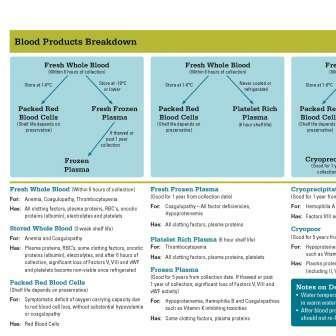 Our video and printable guide on Blood Products goes into more detail on packed red blood cells. Please let me know if you have any other questions!